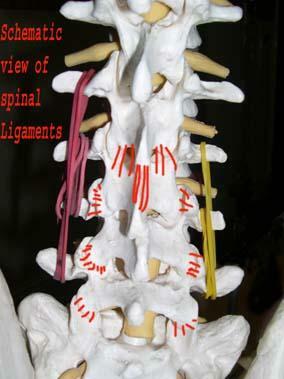 Ligaments consist of fibrous tissue that may be likened to tensioning straps or rubber bands, as shown in this photograph. The spinal vertebrae are held together by ligaments. They can be damaged by sudden or excessive movement. The risk of such damage is increased if you don't take the appropriate exercise regularly. When a ligament in the lower spine is torn, usually by bending forward to pick something up, the pain is immediate and the overwhelming desire is to straighten up. Usually this is not a problem. The muscles around the damaged ligament go into spasm - they tighten up to hold the spine rigid and prevent further movement. The body responds to the injury by increasing blood flow to the area. This causes localised swelling which can increase the pain in the area of injury. It can also cause pressure on nerves which causes "phantom" pain in one or both legs. This is known as "referred pain" because the legs are not injured but the nerves connected to them are being activated. This type of injury will usually heal completely with no long-term problems, provided that you take the right course of action, as advised by your osteopath. This will usually be a combination of manipulation performed by the osteopath and exercises to do at home and heat application, which will be explained to you by your osteopath. Three weeks for most of the pain to go. Six months for full healing. Obviously this varies according to the extent of the injury, your age, general fitness and how dedicated you are to the exercises!